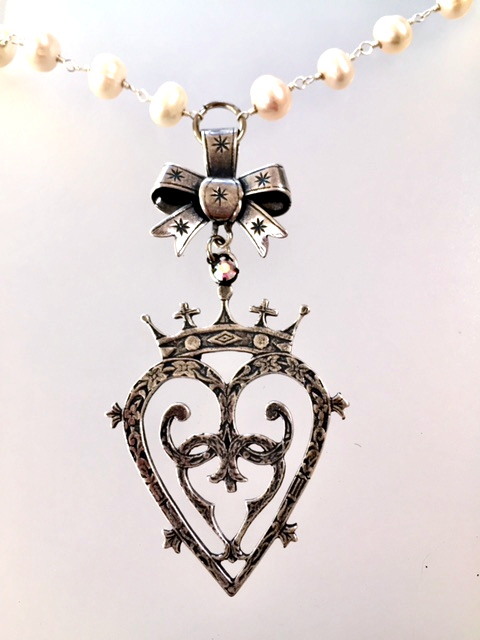 A Long Single strand of Genuine White Freshwater Pearls with Silver wire wrapping, upon which is draped a French Chatelaine Bow and a Large Sterling Silver-plated Luckenbooth charm, cast from the original Art Nouveau Fren ch and Scottish pieces over a century old, these lovely reproductions are hand crafted. I added a Rhinestone to sparkle and catch the light. Pearls are is 30-32" Long, heart pendant is 1.75" by 2.25". Also available in Bronze, please inquire if interested.